WD Backup is a free and official tool for keeping your files and directories backed up securely. Sporting a simple interface, WD Backup provides tools to keep your most important data up-to-date on online cloud storage service Dropbox. 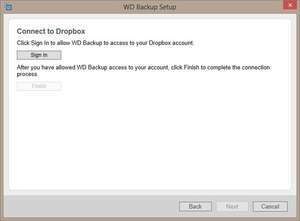 All you have to do is synchronize the WD Backup application with your Dropbox account. The main interface is basic and includes tabs for backup and restore, with the rest being self-explanatory. Version 1.9.6485.41936 is a freeware program which does not have restrictions and it's free so it doesn't cost anything. For security reasons, you should also check out the WD Backup download at LO4D.com which includes virus and malware tests. Additional screenshots of this application download may be available, too.